I have a question about whether I get points for this one. I found that BM0871 (a church) had burned down. I have logged it with photos of the new church and the partially melted bell from the original. Is this what counts for a Destroyed BM? Or is it one that you find that had been marked Destroyed? This one is a found (in destroyed condition) worth 1 point. What you need to find is one that has been logged as destroyed (but in reality wasn't) to get the 10 points. For those in the contest, & those who may not be familiar with PMs here is a picture showing where to look to see if you have a "PM". If you use a pop-up blocker, this will show you if you have any unread PMs. This is a picture of the upper right corner of the forums. If there is a number other than Zero there, just click on it an it will take you to your PMs. In line with the question about the destroyed BMs I have a related question. 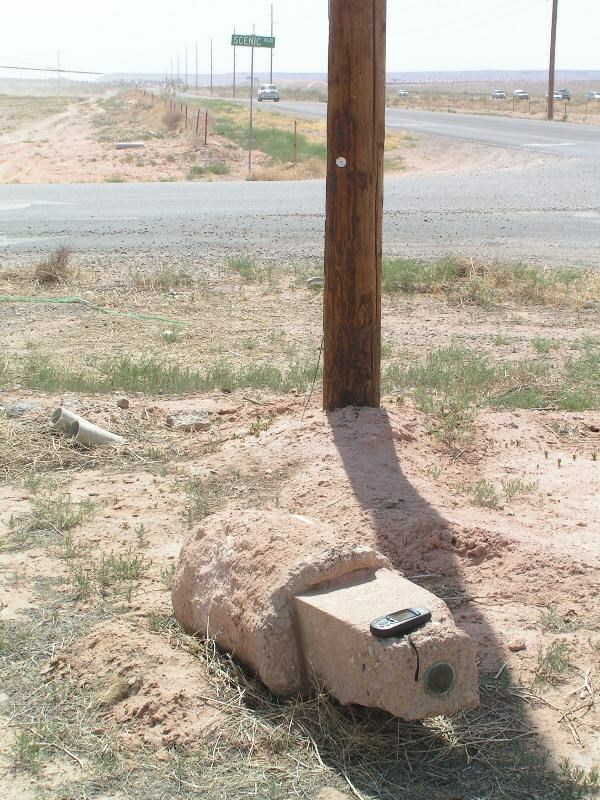 I found a concrete post which had a BM on it at one time but you could see where it had been broken off. Can I log this one for this contest as destroyed and receive the point even though there isn't a disk with the title on it? I'm assuming not but I took a pic of it just in case. Thanks again. For the contest we need to be able to see the disk for verification purposes, so it cannot be used for the contest. For GC.com if you are certain it is the correct position for that mark, then feel free to log it as destroyed. After a check of the Rules, I could not find any reference to needing a picture of the GPSr with the benchmark. Monkeykat, you logged OF2392 as DNF in November of 2006, long before the contest rules were being discussed. According to the rules, the DNF had to have been posted before January 25, 2007. It was, therefore, it meets the requirements for the DNF points. This is a judgement call on our part. If you read all the logs and look at the pictures that have been posted, with a bit of experience, you can get a pretty good feel for what has, or in the case, has not been recovered. There appears to be 2 benchmarks in the area. One is set horizontal and damaged and the other is set vertical some distance away from the first. Knowing that cachers will claim a find for any benchmark that is close to the cache, regardless of which benchmark it really is, and having read all the logs and looked at all the pictures, I feel the previous finder found the damaged benchmark that is set horizontally and therefore the wrong benchmark. The example I gave in the contest rules is a good example. There are no pictures for the last finder, but if you read the logs for that benchmark you will see that the people are logging the section marker and not the described benchmark. I will continue to verify each and every benchmark logged and if there are any questions about a find, rest assured, the finder will get a PM and a chance to "convince" the judge he is correct. Speaking of PMs - would those that receive a PM please read them from the PM folder and not just from the Pop-up window. We put a "Track this PM" on each one to keep track of the one that get read, so if you don't actually go to the PM folder they never show as being read. Thanks. Thank you for the quick clarification. I'll go back and delete my post in the logging thread to keep that thread clean for logs. Finding a wrongly logged benchmark = 15 points - any benchmark where the 'last' log is wrong (must be listed on GC.com). I would subnit that this mark should be considered incorrectly logged by PBPP in 1937 and the NGS in 1946, both of which are agencies of the U.S. Government. My recovery of this station exactly matches the monumentation report in 1931. From the photograph submitted, it is clearly set in a native stone, unlike the the terra cotta pipe decribing Mitchell 1, which appears to have been merged into this datasheet. Above that, the amount of research and effort required to recover this mark would certainly justify additional points, since it has laid dormant for over 60 years and was unknown even to the county surveyor. I implore the judges to take the above in consideration. After reading all the logs and looking at the pictures, we have determined that Difficult Run is correct. Our logic is that the The last official log is for a benchmark stamped Mitchell 1 and not Mitchell 7 which was also in error. Since we benchmark hunters use the latest official log in our searches it is only reasonable to assume that those that had posted DNFs on GC.com were in error. They posted their DNFs for the wrong benchmark (Mitchell 7, Mitchell 1, or maybe it was Graveyard) and not "MITCHELL 2 PB AND PP 1931". Scoreboard has now been adjusted to show the corrected category. So, based on this judgment, am I correct in assuming I will receive the 'incorrect log' points for a mark which I was unable to recover, but for which a previous log has a photo of an obviously incorrect mark? We can get points for logging destroyed intersection stations???? You get a smile for it. I looked and didn't see any destroyed logs for that benchmark that were in error. To get the points you need to find a benchmark that someone logged as "Destroyed" or "Presumed Destroyed" when in actuality it was not destroyed, just not found. You need to actually find the benchmark that someone incorrectly logged. If the previous person logged the benchmark and identified the wrong benchmark in their log and then you find the correct benchmark, you get the points for the "incorrect log". If you do not find the correct benchmark, then you will Not get the points. Just identifying the log that is in error doesn't score any points. It seems as though there is a misunderstanding of what it takes to log a benchmark that was logged in error. First the benchmark needs to have the last log be in error. Then you need to find that benchmark to show that it is in error. The following two pictures that show benchmarks that are considered "Destroyed". The first shows a benchmark that will qualify as a find (in destroyed condition). The second shows the remains of a benchmark that also would be considered 'Destroyed", but does NOT qualify as proof of a logging error, since there is no way to verify the remains. "Scoring = 1 point per verified regular benchmark find plus any special finds that qualifies." The key word is "Find". You need to find the benchmarks that you wish to get the bonus points for. Hope this clears up any confusion That may have occurred. I have a question. I think I found LC0679 and the picture I have only says "Kerrick 1920". I can't find one that says only that. I also don't know how to insert a pix on here. should I just list it on the GC.com database and let you look at it? Nevermind. duh. I found that "kerrick 1920" buried in the long description in the original datasheet. I'll just list and and see if 2oldfarts agree. I'm sorry, I'm just not experienced enough to know for sure when ever I come upon a new case. So in that first picture, the benchmark is considered destroyed even though it's "intact" and readable? It has to remain in the same position also? That means my AX2822 benchmark was actually destroyed even though I found the entire column laying there and the disk was in very good condition? I took a closer look at AX2822 and found out that you did not find AX2822. AX2822 is R 806 RESET that was monumented in 1982. It appears as though you found the original R 806 monumented in 1953, which by the way, is Not listed on the NGS site for active benchmarks. The benchmark you found has been moved from its original position and can not be put back, so it is "Found in Destroyed Condition". If the disk is out of position (tilted) then the value of that benchmark will be in question and it should be logged accordingly, stating that it is possibly out of position and about how much it is out of position. Ok, I understand better now... thanks... I also understand that I just lost myself a point for the sake of understanding... lol... DOH!!! So... if it is "destroyed", what should be done with the disk? Can I keep it as a souvenier? Is there still a fine for defacing it? Did a check and it is officially declared destroyed. I guess it is up to the individual as to how much work getting the disk is worth! Hope you have a BIG sledgehammer. *** NOTE - This dataset contains Destroyed Marks Only. AX1477.an estimated accuracy of +/- 6 seconds. AX1477.and adjusted by the National Geodetic Survey in June 1991..
AX1477.The geoid height was determined by GEOID03. AX1477.degrees latitude (g = 980.6199 gals.). AX1477.The modeled gravity was interpolated from observed gravity values. AX1477.Superseded values are not recommended for survey control. AX1477.NGS no longer adjusts projects to the NAD 27 or NGVD 29 datums. AX1477.See file dsdata.txt to determine how the superseded data were derived. AX1477'3.3 MI SE FROM SMITHVILLE. AX1477'PROJECTING 0.1 FOOT ABOVE THE GROUND. AX1477'NOT RECOVERED. BENCH MARK NOT SEARCHED FOR. Hmm... Dolphin is falling badly behind. Into what mischief can he get to get closer to the middle of the pack? Stay tuned for Episode 5: Dolphin and Bear about a foot above sea level, lost in the swamps. But, Harry, they all start with '8'. Shouldn't we be looking fo a '2'? Would you consider this a "find" on gc.com? Note the previous 4 recoveries (below) were found in a similar manner. I would want more evidence before relying on this as the station mark. Did any of the other shafts protrude like this one? It seems unusual for the shaft of a disk that was set flush in the rock to stick up this much (more like an iron bolt). The question can be answered by measuring from station SAND or by finding the reference trees (the nails would be engulfed deep within). Any large cottonwoods or sycamores nearby? Or the remains of such? For me personally to call HV3761 a find, I would need to measure the boulder to see if it is approximately 12" across and 3' deep. I would also post a picture of the "stem" with the GPSr showing the coordinates and the amount of error in the signal (EPE for Magellan). Also note as Holtie suggests, if there are any trees nearby that may have the nails in them. A metal detector may pick them up to help verify that the right tree was found. Did you mean "Would this be a find for the contest"? HV3077 & HV3559 both qualify as finds for the contest since the official descriptions state that the stem has been mark. As such we can see that the stem was actually located and the station found as described. Neither HV0694 nor HV0366 have anything in their descriptions to identify the remains of the disks and without the disk the find can not be verified. Edited to add qualifications for contest find. What I should have said was the previous 4 recoveries were found in a similar condition. All 4 of those recoveries were submitted to the NGS by BDT and accepted as found. The station mark (or shank) is on property owned by the National Park Service, so the use of a metal detector is prohibited. HV3077/Sand is about .3 of a mile away, over very rough terrain, so measuring from that distance is beyond my capabilities to do so accurately. I did not observe any sycamore or cottonwood trees in the immediate area. Even if they survived, those trees would be over 70 years old. HV2830/QUAR 1913 and HV3756/Tree are very close by, but there is no evidence of either station. A metal detector (prohibited) would be needed to find these two marks also. I have four closeup photos of the shank, with the GPSR showing position and EPE. N38' 54' 58.1' W077' 06' 15.1' - EPE = 18 feet. N38' 54' 58.1' W077' 06' 15.2' - EPE = 18 feet. N38' 54' 58.1' W077' 06' 15.2' - EPE = 19 feet. N38' 54' 58.1' W077' 06' 15.3' - EPE = 18 feet. The southwest view is obscured by cliffs about 150 feet in height, so even a survey grade GPS might have trouble getting a good lock on the satelites. Looks like the only way to establish this mark would be going "old school" with a theodolite and turning angles to known points north of the river. 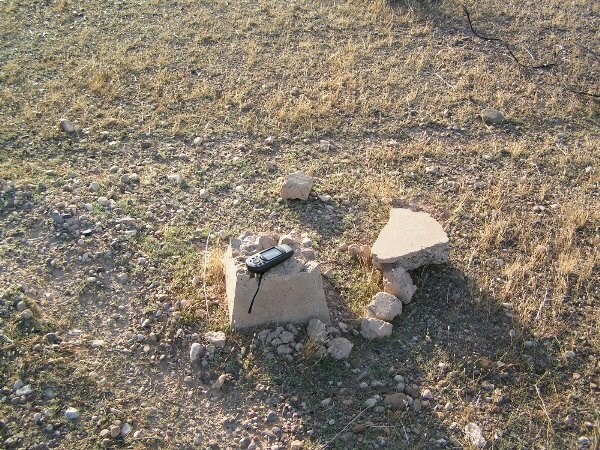 I'm fairly certain that this is the remains of a benchmark, but I cannot ascertain which one it is or who it was set by. If you look at the recovery reports of the monuments along the Potomac River, most of the disks are missing, leaving only the shanks or stems intact. My apologies for such a long winded narrative. Thanks to John and Holtie for your thoughts on this. Please note for the contest special scores you need to Find the correct benchmark to get the points. If someone logs a benchmark as DNF you need to FIND that benchmark. If someone logs a benchmark as DES destroyed, then you need to FIND that benchmark. If someone logs the wrong benchmark (ERR) for a given PID# then you must FIND the correct benchmark described. Finding only the stem of the benchmark does NOT count, since we have no way to verify what you found. All points are awarded for Finding the benchmark. I forgot to add that if it is a benchmark disk, you need to find the disk for verification purposes. We can't tell what disk was found by looking at the stem. Does anyone know what "height of light" means in some benchmark descriptions? You are correct, Harry. As long as it has been over a year since it was last logged by the person who wishes to use it for the bonus, it is fair game. I mean if the NGS Station is gone and you Waymark the one remaining reference mark does it count? If it was a year I hurried for a good reason last night to beat the dark on Buffalo. edit: darn not a year yet. Now I just need a 2. Sorry, but the rules say it has to be in the GC database and it has to be the benchmark described on the datasheet. Besides there are NO "B"s in "2OLDFARTS"? Do we smell Buffalo chips?? It tis in the Geocaching data base. In other words though it has to have it's own PID. It should be point out that some of the participants in this contest are having far too much fun! Just read Doc Geo's and Klemmer & TeddyBearMama's latest entries. Unfair! LaBrea Tar Pits?!? While out benchmarking today, I found a BM that has two different PID's. It is the same exact benchmark. While I don't have a problem with logging both PID's in gc.com, with a note on each PID referencing one to the other, it does kind of feel "wrong" to claim both PID's as founds for the purposes of this contest. What say ye, do I claim a 1-point contest Found for each PID, or just pick one and claim it? They are NE0647 and NE0853. From the judges point of view, it is best to only log the one that you found! If you compare the 2 datasheets, one (NE0647) is 3 1/2 feet above the ground. Read that as 42 inches above ground. The other (NE0853) is 1.18 meters above ground. Read that as 46 inches above ground. So which did you find? Take a look at BM1033. The 1935 entry says the station is the center of the tower. The 1943 entry says the station is the flag pole. I found this location, took a picture, but as previous visitors found, there is still no flag pole. So have I found this benchmark or not? "DESCRIBED BY COAST AND GEODETIC SURVEY 1935 (CAS) THIS STATION IS THE CENTER OF THE CLOCK TOWER OF THE LEE COUNTY COURTHOUSE." If the center of the clock tower is still there, then it is a find. Measuring from an easily changeable surface such as the ground is prone to error over time (landscaping, water and wind errosion, etc), and it was 10 years between the two datasheet descriptions. The 2.2 feet from the building corner is constant, and there was no evidence of another station being 4 inches lower or higher and that would be easily determined in this situation. One thing is for sure, I found only one even if it had two PID's and that's all I feel comfortable logging for this contest. I'll log just the latest PID. Thanks for pointing out the height discrepancy, I didn't do the actual math on that part of the description. You know...we think that if a mark has a PID# with the NGS, It is fair game for the contest. The basic premise of the contest is to recover benchmarks, so that the page on GC.com at least gets updated for any surveyor who happens to check the pages before using. No other contestant should complain and we see no reason not to log all PID#s in the GC database. Do we rule out any building that has 2 spires that each has its own PID#, or 2 radio towers close enough together to get them both in one picture. What about the Triangulation station where each disk (the station disk and each RM) has its own PID#? I am glad this has come up. It is similar to my question. I have a unique (I think) situation where an intersection station has two separate PIDs for the same statue. QE1874 and QE1939. What is your ruling on this find, or is that finds? After checking the datsheets (GC.com benchmark pages, that is) we see both have adjusted coordinates. The coordinates put the intersected points about 6 feet apart, therefore it must be to different intersection stations. 2 different adjusted coordinates, 2 diffferent PID#s, sounds like 2 different benchmarks. We have asked that you only post pictures that are readable. Starting tomorrow 4/12/07 any log where we can NOT read the designation / stamping on the disk will NOT be allowed! Sorry to have to do this, but we just don't have the time to run all the non-readable disks through the photo-enhancing programs. OK, I understand we can expect to get put on notice if any are too battered, or if the photography is too poor. Suppose a station mark is too battered to read the stamping (but is clearly a station mark), would a photo of the still-readable reference mark serve as proof of what station mark it is? For adjusted marks, wouldn't the co-ordinates on the GPSr in the photo (that match the listing) help serve as verification? Then there are the marks which have no stamping, and are so described...what then? I'm sure I can speak for all the contestants when I thank you both for all the time you are spending looking at our logs. I wouldn't expect you to spend more than about 30 seconds looking at any of my photos before hitting the REJECT button and moving on to the next one. I am not keeping track of my score separately (so I wouldn't know if you rejected one or more anyway! ), and I trust your judgment in this implicitly. When taking pictures of benchmark disks there are 2 things to help improve the quality of the shot. Use a powder like corn starch to bring out the details. Sprinkle it on, rub it in, and wipe off the excess. The corn starch will remain in all the depressions. For those benchmarks with shallow stampings, this will make it a whole lot easier to read the disk. Besides, corn starch is biodegradable. Also, take the picture at a slight angle, instead of straight on. With our GPSr laying next to the disk we can see our reflection in the GPSr screen if we are taking the picture too straight on. Changing the angle just a little and we can then read the display on the GPSr. Get closer to the disk, so it fills the view finder. It is mostly learning to see what is in the view-finder of the camera. If we can't read the disk in the view finder, odds are we won't be able to read the disk in the picture. With digital cameras you can preview the picture to make sure it is readable before you leave the area. Concerning battered disks, use the corn starch and get the clearest picture possible. We understand that there are disks out there that are nearly impossible to read, but the corn starch will help bring out the stampings that are left. What we are mainly refering to are pictures where the stampings are there, but the picture doesn't allow us to read what is supposed to be stamped on the disk. The disks are not damaged, but we can't read what is stamped there without using a photo enhancing program. If the disk is not stamped and the datasheet says so, then the picture should show a clear shot of the unstamped disk, so that the edge of the disk can still be read. The edge will often contain information that will verify if it is the correct disk or not. We understand that there are circumstances that will prevent optimum pictures from being taken, but we are talking the common everyday benchmark picture, here.